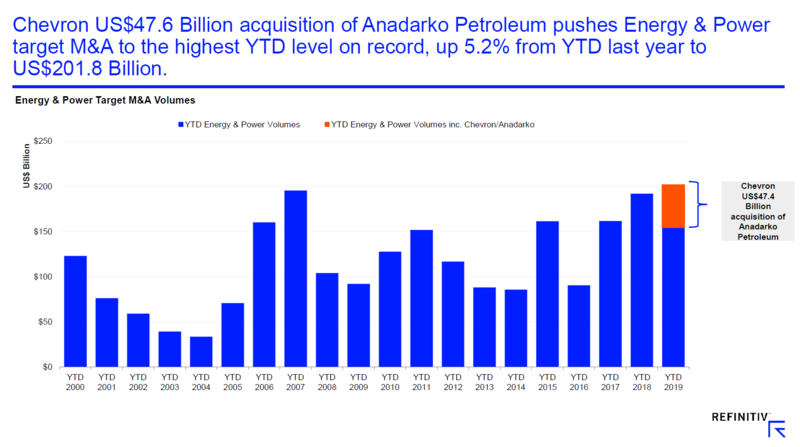 Chevron may have just unleashed a new wave of deals in the oil patch with its $33 billion acquisition of Anadarko. Shares of other independent exploration and production companies jumped as investors speculate on other targets, driving up valuations for a sector that has lagged the market. "I do think this will start a land rush of deals," Again Capital's John Kilduff says. Chevron's $33 billion acquisition of Anadarko could set off a wave of new merger activity in the oil patch as the major companies seek out a bigger foothold and lower costs in the U.S. shale sector. Stocks of prospective targets surged after the deal was announced Friday. The speculation centered on major Permian shale players, like Pioneer Natural Resources, Parsley, and Concho Resources, all up about 10%. Others were also higher, including Apache and Hess, with a big position in North Dakota's Bakken basin. Occidental Petroleum, was initially higher but reversed gains after CNBC's David Faber reported that it had made an earlier failed bid for Anadarko, and it is now considering options. "You have more than 100 producers in the Permian. The E&Ps have gotten better about turning cash flow positive but the big guys, Exxon, Chevron and Oxy [Occidental] are planning to get bigger. They're all planning to expand in U.S. shale. even though they all have longer term projects," said Stewart Glickman, energy analyst at CFRA. "Exxon and Chevron had deep water. They have [liquified natural gas], but they are still pushing more in the direction of shorter cycle projects, and that means U.S. shale." "Different from last year, this transaction could also 'kick-start' investor interest in E&P's with current valuations looking attractive, [free cash flow] generation that is growing, oil prices that are well above most budgets while service costs remain benign, and now possible interest by the Majors making the prospect for larger premiums and a cash component," Hanold wrote in a note. The U.S. has become the world's largest oil producer because of the shale production boom. The U.S. produced 12.2 million barrels of oil a day in the past week, surpassing Russia and Saudi Arabia..
"This cements the trend of big oil becoming big shale," said John Kilduff of Again Capital. "Shell may be hearing footsteps in terms of competition, and I think BP will be looking around again. I do think this will start a land rush of deals." Kilduff said higher oil prices have made deals more attractive, but they're not so high as to discourage buyers. "We're in a medium price environment. If you look at the futures curve out to 2028, the forward curve can support these deals and these valuations," he said. The price of West Texas Intermediate was at $64.50, up 1.5% Friday. "Generally speaking the small fries are targets. Anadarko had a net debt to capital ratio of 62%. The average E and P is more like 35%. I would say [targets] will have high debt levels or poor free cash levels," said Glickman. "Another thing Anadarko had working against it was its reserve life was pretty low." Chevron shares fell 4%. Based on Anadarko's closing price of $46.80 on Thursday, Anadarko shareholders will receive 0.3869 shares of Chevron and $16.25 in cash for each Anadarko share.